Before the first 20-Caliber factory cartridge (the .204 Ruger) appeared, "Twenties" were not well-known to most shooters. Only some very dedicated varminters and die-hard Wildcatters played around with the 20 Caliber variants. Over the years, however, through the hard work of Todd Kindler of the Woodchuck's Den and other sub-caliber pioneers, 20-Caliber (and 17-Caliber) cartridges have become very popular. Today's small-caliber shooter finds a wide selection of barrels, bullets, reloading dies, and accessories. This guide covers five of the most popular 20-Caliber cartridges: .204 Ruger, Tactical 20, 20 PPC, 20 BR, and 20 VarTarg. You've probably heard of the "20 Tactical", Todd Kindler's 20-cal cartridge based on the .223 Remington necked down to 20 Caliber, with the shoulder modified to 30° and pushed back. You can buy 20 Tactical brass from Dakota Arms, or form your own cases. But there's an even simpler 20-Caliber option based on the .223 Rem parent case--the 20 Practical, which is simply the .223 Remington necked to .204. 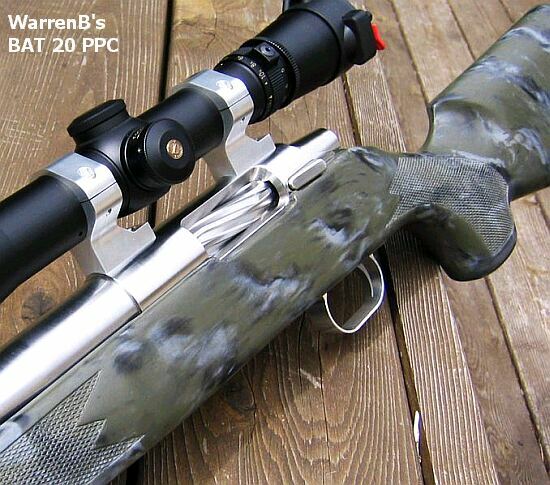 The 20 Practical is the brainchild of Warren Brookman, who has shot it with considerable success in his bolt guns. 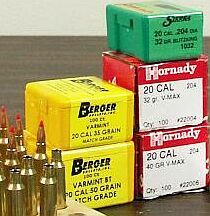 Warren's 20 Practical rivals the .204 Ruger for velocity, and you can use your regular .223 Rem Redding Type 'S' dies. Just change out the bushing in your neck-sizing die, and substitute a different decapping pin assembly and expander button. All the details are explained in Warren's 20 Practical Feature Story. The 20 Practical is an ideal 20-caliber solution for AR15 platforms. The 20 Practical feeds and functions 100% reliably with standard AR15 magazines. No mechanical mods are required to your AR, other than a barrel change. You can start with .223 Rem brass, and just size down the necks with a neck-bushing die. It works best if you bring the necks down in two stages. Robert Whitley has been developing a 20 Practical AR15 for us. 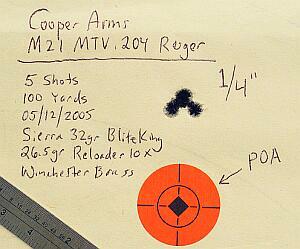 Robert reports outstanding accuracy with both 32gr and 40gr bullets. Our prototype rifle is delivering 1/2-MOA or better accuracy with Berger bullets and H335 powder. Velocity is 3750 fps with the Berger 40-grainers in a 24" barrel, and the 32s will run 4000 fps with the right load. Other good powders for the 20 Practical are H4198, N133, H322, and Accurate 2460. Shown below is Robert shooting an AR15 with a 20 Practical Upper. This rifle is fitted with a side bolt handle and GG&G forward scope mount. Robert's company, AR-X Enterprises, plans to produce similar 20 Practical AR15 uppers for sale; these should be available by September, 2008. As you can see, there is almost no recoil. With virtually no load development, Robert achieved excellent accuracy. In the video below you can see Robert shooting a five-shot group rapid fire. Why are folks turning to the "Terrific Twenties"? Among the most important reasons are: low recoil, high velocity, low noise, reduced cost, longer barrel life, and better ballistics for a given bullet weight. In short, compared to a .223 Rem, a Twenty shoots flatter, costs less to shoot, and is easier on the shooter's shoulder and his barrel. The first time you shoot a 20-Caliber rifle, you'll note that there is minimal recoil, meaning the muzzle stays on target. No loud, dust-kicking muzzle brakes required here. You can shoot and actually "see the show". The rifle doesn't move enough during recoil for you to loose your target in the scope. This enables you to quickly asses the results and make a follow-up shot, if need be. A related advantage is low blast and noise. Even with relatively short barrels, 20-caliber rounds burn less powder than larger varmint cartridges such as the 22-250, and the Twenties make less noise. This definitely works to the hunter's advantage in a large field of ground squirrels or prairie dogs. I'm often asked how a 20-Caliber gun compares with the ever-popular .223 Rem. Well, I tell people the Twenty is flatter-shooting, easier on barrels, and it is a better choice for small varmints, whether you want to "mist 'em" or save the pelt. The Velocity Edge--A .204 Ruger drives a 40-grainer 600 fps faster than a .223 Rem can push the typical 22-Caliber 50gr bullet. This higher velocity produces a flatter trajectory. Additionally, grain for grain, 20-Caliber bullets have higher ballistic coefficients than .224 bullets. Combine this with the extra velocity of the 20-Caliber, and you get superior performance in the wind. Run the numbers and you'll see--a 40-grainer shot from a .204 Ruger has less drop AND less wind drift than a 40gr or 50gr bullet fired from a .223 Rem. You'll find the data in the chart below. Component Economy and Barrel Life--All the Twenties burn way less powder than a 22-250, and the smaller Twenties use less powder than a .223 Rem. This attribute actually has two advantages. First, it makes shooting 20-Caliber cartridges more economical, but mostly it means less barrel heat. A typical varmint hunter may shoot several hundred rounds in one day, so barrel heat is an important issue. Terminal Ballistics--For hunters seeking maximum explosive effect on a small varmint, Twenties deliver the goods. Because it passes through the rifling much more quickly, a 20-Caliber bullet will be turning much higher RPMs than a 22-caliber bullet launched from a barrel of similar twist rate. Experienced varminters will tell you that high spin rates create the most explosive impacts. On the other hand, if you shoot a non-fragmenting bullet, the Twenty can minimize hide/fur damage. If you plan to keep the fur, you want the smallest possible hole or damage to it. Load data from Hodgdon.com, for 24" barrel. 2.250" COAL .204s, Fed 205s. 2.210" COAL for .223 Rem, Winch SR. 2.350" COAL for 22-250, Winch LR. Always start 10% low and work up. Calculated at 1000' altitude, 80° temperature. By far, the most popular 20-Caliber bullets are the factory-made pills from Berger, Hornady and Sierra. These are available in Flat-Base, Short Boat-tail, and Full Boat-tail designs in weights ranging from 30 to 50 grains. While most of these bullets are designed for varminting, many target shooters are using the 40-50 grain bullets with considerable success. A 12-twist will stablize most bullets up to 40 grains. After that you'll need a 1:11" or 1:10" twist. To shoot the Berger 50s, Berger recommends a 9-twist. Which Bullet Should I Use? When selecting bullets, the general rule of thumb is "let the rifle decide what bullet it likes". Every rifle, powder, primer combination may shoot one brand of bullet or one weight range more accurately than another. 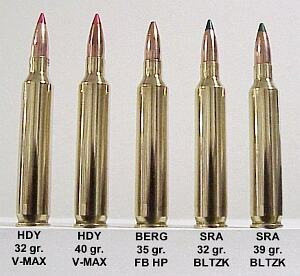 As you change bullet weight, you may find that you need to change the brand to maintain accuracy. For example, as stated earlier, some rifles will shoot a Hornady 32gr V-MAX very well, but they won't shoot the 40gr V-MAX. However, the same rifle may like the Sierra 39 grain BlitzKing. You may also find that some brands may shoot very well, but only if you sort the bullets by weight or base to ogive length first. In our experience, nearly all factory bullets benefit from sorting. The Hornady V-MAX bullets and the Sierra BlitzKing tend to be equally explosive and both fragment very well. We suggest you try both and use the brand that shoots better in your rifle. Although we have heard no complaint about the Berger bullets no being explosive enough, polymer tip bullets (Hornady and Sierra) tend to be more explosive than the Berger, but maybe not quite as accurate. The Berger 30gr and 35gr Flat Base bullets tend to fragment more than the 40gr or 50gr Berger Boat-Tails. 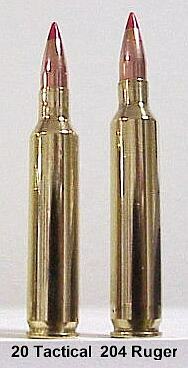 True Boat-Tail bullets normally have less bearing surface area than Flat-Base bullets of the same weight. This means you can expect more velocity from a Berger 40gr LTB than the Hornady 40gr V-MAX or the Sierra 39gr BlitzKing. Choosing the correct bullet weight will depend on the environmental condition and the size of prey. Lighter bullets shoot flatter and faster thus giving you longer range, however, they tend to drift more with wind than the heavier bullets. Likewise, heavier bullets drift less and have a bigger knockdown power, but you won't get the same kind of range from them. Most reloaders develop two loads: one with a fast, lightweight bullet for long range on calm days, and a slower but heavier bullet for windy days or larger varmints. We've compiled complete ballistics tables for the most popular Berger, Hornady, and Sierra Bullets, with drop and wind-drift calculated from 100 to 500 yards. We've run the ballistics for a range of start velocities, so you can compare different cartridges. Click Here to VIEW Ballistics Tables. Don Unmussig Bullets:. Don manufactures 30, 35, 40, 45, 48, 50, 52, 55, and 57 grain .204 caliber HP bullets. The 30 and 35 grainers are Flat Base. Don offers both Flat Base and Boat Tail designs in the 40-55 grain weight range. Don's 57 grainer, a 15-ogive VLD, is probably the highest BC 20-Caliber bullet you can buy. Don also manufactures 30gr and 33gr Round Nose Semi Point (RNSP) for the Remington 5MM Rimfire cartridge in HP or lead-tipped. These bullets can also be used in centerfire cartridges. Custom weights available. Contact: (804) 320-1165. No web site. No Name Bullets:. Michael Liechty is the new owner of No Name Bullets. He is currently the only 20 Caliber bullet-maker specializing in match-grade projectiles. Phone: (949) 933-0362. Schroeder Bullets: Steve Schroeder makes 5MM Remington Rimfire bullets that will work in 20-Caliber centerfire cartridges. In 40gr Steve offers Round Nose Semi-Point (RNSP), FMJ, SP, and HP designs. In 45gr, Steve makes SP and FMJ bullets. Contact: (619) 423-3523. No web site. Most barrel manufacturers produce 20-Caliber barrels. In fact, these days it's somewhat unusual to find a major barrel-maker that does not produce .204-bore barrels. With regards to twist rate, there aren't that many choices. Right now, it seems that only 1:9", 1:10", 1:11", and 1:12" twist rates are being manufactured. But the 9- and 11-twist are not made by all of the barrel makers. The 12-twist is the most popular and works very well with bullets up 40 grains. Some 12-twist barrels do seem to shoot the 40-grainers accurately, but that's probably at the edge of the stability envelope. Others have found that when the 40gr bullets will not stabilize, the Sierra 39gr BlitzKing bullets stabilize quite well in the 12-twist. For most bullets heavier than 40 grains, an 11-twist or 10-twist is recommended. Introduced in 2004 by Hornady and Ruger, the .204 Ruger is the only 20-Caliber cartridge offered as factory-loaded finished ammunition. With 32gr bullets, Ruger claims the round is the fastest factory cartridge in any caliber. The .204 Ruger is based on the 222 Remington Magnum case, necked down to 20 Caliber. Currently, Hornady, Remington, and Winchester produce brass for this caliber. Because this cartridge is in large-scale production, it is the most popular of all of the 20-Caliber cartridges listed in this guide, even though it is the newest of them all. The .204 Ruger isn't fashionably "short and fat". It bucks the trend in modern cartridge design. Nonetheless it delivers great performance and surprisingly good accuracy. Our friend Ken Lunde has a Model 21 Cooper MT Varminter chambered in .204 Ruger. With factory ammo, it shot slightly over half-MOA. With his handloads (Reloader 10X and Sierra 32gr BlitzKings), the Cooper delivers quarter-MOA 5-shot groups at 100 yards. While low-profile cartridges like the 20 BR are normally more efficient than a tall and thin case, the .204 Ruger more than holds its own, speedwise, versus any of the popular 20-Caliber cartridges. The smaller diameter case-head gives it one important mechanical advantage over the larger diameter 20 BR--less bolt thrust. This means the .204 Ruger can be used in some very compact falling-block actions which are not suitable for cases with a .308-sized rim. The .204 enjoys one huge advantage over all the other popular twenties--the availability of factory ammunition. We reloaders may scoff at the idea of buying factory fodder, but it's nice to know that option is available, particularly on an extended varminting holiday. WARNING: For your own safety, ALWAYS reduce all starting charges by 10% and work up carefully! Ambient temperature changes, powder lot variations, and differences in barrel friction can result in significantly increased pressures. Recently we talked with Todd Kindler about the 20 BR. He told us "If you like the 6mm BR, you'll like the 20 BR even better." He suggested we run the ballistics at 500 yards for a 50gr .204 Berger at 3900 fps. Well we did, using Point Blank software (with a 1000' altitude), and the results are shown below. The 105 Scenar has 5" less wind deflection, but the little 20 drops nearly two feet less. Conclusion: the 20 BR shoots flatter than a 6BR at 500 yards, and in calm conditions, it can really shine. 6mm BR 105gr Scenar 0.530 2900 fps 63.89" 15.46"
20 BR 50gr Berger 0.296 3900 fps 41.14" 20.58"
At first, when looking at the specs, it may appear that the 20 BR is an overbore cartridge, but real life testing has proven otherwise. WarrenB (Fireball), an avid 20 BR shooter, states "I really love my 20 BR. I have put around 500 rounds through it and my buddy's bore scope shows no real wear yet at the throat. The nice thing about the 20 BR is that it is so easy to push a 40gr. bullet at 4000 FPS with mild pressures. The recoil from the 20 BR is mild with a heavy rifle using a good bench-type stock. I think the sweet spot for the 20 BR is as a heavy, shoot from the bench, prairie dog rifle shooting 39 or 40gr bullets easily at 4000 fps on a hot day with no pressure worries. It is obviously very accurate as well. In terms of case-forming it is as easy--just buy 6BR brass and neck them down. I am using my existing 6mm and 22 BR dies to do everything. Only a new bushing was required." 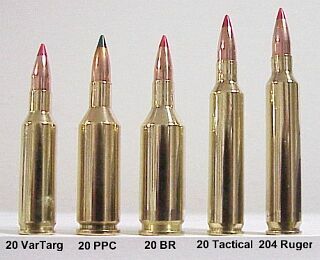 The 20 PPC is the smaller brother of the 22 PPC and the 6mm PPC. 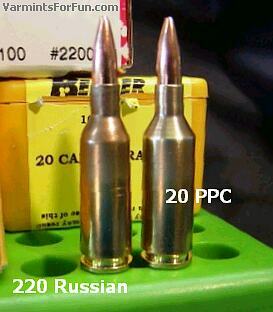 All three PPC cartridges are based on the 220 Russian case. Initially, the 20 PPC was used mostly by varmint shooters looking for a high-speed, flat-shooting cartridge with exceptional accuracy. But the 20 PPC is finding a place among Benchrest Competition shooters, now that match-grade 20-Caliber bullets are becoming readily available. Running a 50gr Berger (.296 BC) at 3800 fps, the 20 PPC actually shows less wind drift than a 6mm PPC shooting 68-grainers at 3250 fps. 20 PPC shooters feels this gives them an edge in windy or rapidly switching conditions. The 20 PPC is formed by using a 22 PPC die with a 20-Caliber bushing. Bushing size depends on your neck diameter and whether you have turned necks. For varmint shooting, neck turning is not worth the effort. Any accuracy advantage is negligible. But among competitive benchresters using the 20 PPC, most believe that a tight-necked chamber with turned necks will give you a slight edge. Once the brass has been necked down from .224 to .204, you'll need to fire-form it. There are various fire-forming strategies covered in our 6PPC Cartridge Guide. The simplest method is to use a full 220 Russian load from your powder-maker's data sheet, seat a bullet into the lands, and shoot. You may be surprised at the accuracy that can be achieved during fire-forming. Bob Smith reports excellent accuracy (.2 MOA or better) when fire-forming with his Lilja-barreled 20 PPC. And John (SnakeEye) of VarmintsForFun.com tells us: "These 20s are a pleasure to shoot and load for. I am really pleased with the 40gr V-Max as it flat shoots very well out to 600 yards in my 20 PPC. Hornady did a fine job designing that bullet. What has amazed me is how well the 40-grainer shoots in my fast-twist barrel (Lilja 1:9") in the BAT Rifle. I use naked bullets and can shoot 30 to 40 rounds before I need to clean and there's hardly any fouling. There's practically no recoil and there is a noticeably reduced muzzle blast." 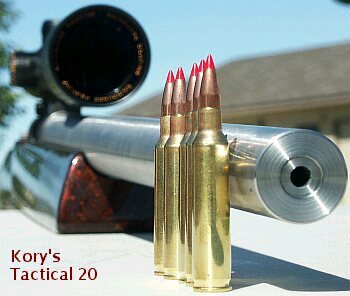 The Tactical 20 was invented by Todd Kindler long before the .204 Ruger hit the market. Based on the .223 Remington parent case, the Tactical 20 is simply the .223 necked down to 20 Caliber with a 30-degree shoulder. Some versions have slightly less body taper as well--it's wise to compare reamer prints. Although the Tactical 20 has about three grains less case capacity than the .204 Ruger, it delivers very similar performance. With the right load, you can get Max velocities with 32- and 40-grainers that give up little or nothing to the .204 Ruger. Varmints probably won't know the difference. The Tactical 20 is easy to load and exceptionally accurate. Currently, Cooper Arms of Montana and Dakota Arms offer factory rifles in Tactical 20 chamberings. Since the Tac 20's parent case is the ubiquitous .223 Remington, there is a huge selection of high quality brass available, limited only by your budget. Some precision shooters like to start with Lapua brass. The author has had excellent results using IMI brass, which is strong and very durable. Forming 20 Tactical brass is generally a two-step process. You start with a 223 Remington brass that has been full-length sized in a .223 die. Then run the brass through a Tactical 20 forming die, and finally run it through a Tactical 20 full-length die. Case lubrication/wax should be used very sparingly just on the neck and the body. Too much lube will result in wrinkled shoulders. Although the wrinkles will blow out once the case is fired, they make the cartridge looks somewhat unattractive. 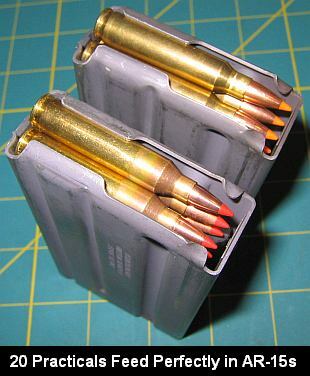 The author has had great results using Redding dies with Hornady Unique Case Lube, while others prefer Imperial Sizing Die Wax. The Hornady Unique Case Lube is a little thinner, so it tends to be more forgiving if too much is used. Some reloaders, like the author, will anneal the brass as the final step. Although not necessary, annealing tends to help the fire-forming process and extends the life of the brass a bit. Lapua-brand Tactical 20 brass has arrived in the USA, and is available through Dakota Arms, Graf & Sons and other retailers. Grafs.com list the brass as a Dakota Arms product, item # DU4HH5006, priced $39.99 per hundred. With the factory brass, Tac 20 shooters won't need their form dies anymore, and, in all likelihood, a separate fire-forming process will become superfluous. Or at least fire-forming will no longer change case capacity to the extent that you need a separate, slightly lower, fire-forming load. The 20 VarTarg (VARmint/TARGet) is another 20-Caliber cartridge designed by Todd Kindler for varmint hunting. This cartridge is based on the 221 Fireball case and is probably the most efficient of the 20-Caliber cartridges. It is also extremely accurate. Like the 6PPC, it has the optimal bore to case capacity ratio for max efficiency. The VarTarg is popular with varmint hunters because it provides good range (up to 300 yards) and uses relatively little powder, so your barrel doesn't heat up quite as fast. With the 20 VarTarg, long barrel life can be expected. Check out the Load Map below and you'll see that the diminutive VarTarg pushes the 32gr pills up into the 3750+ fps range with much less powder than is used by the .204 Ruger or 20 BR. The VarTarg achieves this performance by using fast, high-energy propellants, such as H4198 and Vihtavuori N120. Todd Kindler reports great accuracy with N120 and the Sierra 32-grainer, running close to 3800 fps. The VarTarg may be the smallest 20-Caliber cartridge in our survey, but it comes up big in efficiency. (Photo is 100% scale.) Currently, Cooper Arms of Montana and Dakota Arms offer factory rifles in 20 VarTarg. Click Here to download a .pdf version of Todd Kindler's 20 VarTarg article (from Dakota Arms). No special dies are need to form 20 VarTarg brass. Simply run a .221 Fireball case through a 20 VarTarg full-length sizer die--then load, and shoot. There is virtually no difference performance-wise between virgin brass and fire-formed 20 VarTarg brass, so you don't need two different loads. Right now Remington is the only source of parent .221 Fireball brass. Most 20 VarTarg shooters are satisfied with the quality (and price), so long as the Rem brass is weight-sorted and prepped before loading. There was some hope Lapua would produce 20 VarTarg brass for Dakota Arms, but that deal is off the table. If there is enough consumer demand, Lapua might bring out 20 VarTarg or (more likely) .221 Fireball brass on its own--but don't hold your breath. John (SnakeEye) of VarmintsForFun.com hopes Lapua does produce 20 VarTarg brass: "That will open up a whole new world in the little 20s. I've always thought that the 20 VarTarg would make a very accurate benchrest round with good brass. It seems to be a good combination of case capacity and bullet. Also this will be perfect for the 17 m 4 as all you would need to do is run it in a 17 m 4 FL die, no other forming." BlitzKing VV N120 17.6 na Rem 3750 PacNor 1:11 Dean's Savage Load: "Love the cartridge." 35 Berger FB H322 20.6 Fed 205m Rem 3511 Pence 23" Best H322 load for AccurateReloading.com. 3723 fps with 20.0 gr H4198. To learn more about the five cartridges we've featured, or other 20-Caliber Wildcats, get yourself a copy of Todd Kindler's book The Terrific Twenties. Todd's treatise is the de-facto bible of sub-caliber cartridges. It contains cartridge history, case formation procedures, load data, advanced reloading techniques, rifle information and much more. The book covers all of the cartridges listed here, and many more. Order The Terrific Twenties from Todd at The Woodchuck Den, (330) 897-0614. Another great publication is Small Caliber News, a quarterly journal dedicated to 22-Caliber and smaller cartridges. This magazine contains tons of great technical and non-technical information for the small-caliber enthusiast. Click this link to read a sample SCN article about the Tactical 20 cartridge. Kory Hamzeh and 6mmBR.com would like to thank, in alphabetical order, WarrenB (Fireball), LeRoy Benson (Silverfox), Blake (CajunBlake), Al Boyechko, Alex Clarke, Dan Clements (DanC), Brooks Harman, Richard Miller (REM), Dave Moore, John Siebel (SnakeEye), Bob Smith, Doug Stiner (MontDoug), and Gary Wenzl. Without their load data, wise advice, and invaluable assistance, this page could not have been created. A special thanks goes to Todd Kindler, whose hard work over the years has brought the merits of sub-caliber cartridges to the attention of the general shooting community. The following tables provide external ballistics information (bullet drop and bullet drift) out to 500 yards with a range of useful velocities for the popular 20 CAL Hornady, and Berger bullets. Ballistics Data was generated with Sierra's Infinity Software Vers. 5.1 using manufacturer's published ballistic coefficients. Common Parameters for All Tables:" Distances in Yards. Zero @ 100 yards. Ruger .204 target photo copyright ? 2005 Ken Lunde, All Rights Reserved, used by permission. Rifle Photo by WarrenB, used by permission. All other content and design Copyright ? 2005, 6mmBR.com, All Rights Reserved. No reproduction of any content without advanced permission in writing. Topics: Ruger, .204 Ruger, 20 Caliber, 20-Caliber, Twenty Caliber, 20 BR, 20 PPC, 20BR, 20PPC, 20 Vartarg, Vartarg, 20 Tactical, Tactical 20, Cooper, Cooper firearms, M21, Model 21, MT varminter, Montana, 20 caliber, .204, .204 Ruger, Ken Lunde, Wildcat, Wildcatter, Wildcatting, Ackley, precision rifle, hunting, varmints, varminting, groundhog shooting, Prairie Dogs, rifle accuracy, guns, 6mmBR, 6BR, 6 Dasher, .223, 223 Rem, Ackley Improved, 6 REM AI, Vihtavuori, N120, N133, N550, N540, VV N160, Varget, IMR 4064, AA 2520, BAT custom actions, PacNor, Savage, Walnut, Laminated Walnut, Reloader 7, Reloader 10X, H4895, 8208, H4198, H322, Benchmark, reloading, powder selection, case forming, fire-forming, Winchster Brass, Sierra, Blitz-King, V-Max, Hornady, bullets, moly, gunstock.